Jill Sweeney leads technical Knowledge management for volume servers, composable systems, high performance computing and Artificial Intelligence (AI) at Hewlett Packard Enterprise. Jill and her team are transforming the experiences customers and partners have with HPE's products, solutions and support information to foster positive customer business outcomes. No stranger to change management and transformation, Jill has held technology focused and marketing roles at HPE including launching both the Internet of Things (IoT) and mobility go-to-market programs as well as managing global brand programs for Hewlett Packard's Starbucks Alliance and employee communication engagement. Prior to the HP/Compaq merger, Jill drove alliances for a Compaq owned start-up, B2E Solutions. Jill is a champion for Inclusion and Diversity as well as STEM Careers. She actively support HPE Code Wars and University recruiting. This year, Jill has taken a new challenge, addressing a societal problem of human trafficking. She is working with a local organization to give female victims of human trafficking career coaching and referrals to coding camps to break the economic cycle, supporting dignity and sharing hope. An inspirational and motivational speaker, Jill has recently given industry keynotes on topics including IoT trends, diversity, employee engagement and work-life transformation. Jill has served on the Anita.Borg Partner Forum to select technical topics and source industry leading speakers for the Grace Hopper Celebration panel submissions. Stop world hunger, really? According to the World Economic Forum, the global population will increase to an estimated ten billion people by the year 2050 and will demand 70% more food than is produced today. That’s a lot of people to feed and will put greater stress on natural resources like water. Feeding this expanded population nutritiously and sustainably will require substantial improvements to the global food system – where nearly 1/3 of food produced is lost due to waste or supply chain inefficiencies. In order to meet the increasing demand, researchers predict agricultural output must double. But how? One way is by maximizing output and driving more efficient use of resources, especially in very remote and traditionally technology-free locations. One key to achieving abundant crop yields is by targeting microclimates and measuring water usage and nutrient levels. That means deciding what are the best seeds to plant in what types of soil and making sure enough fertilizer is used. All these activities must be done sustainably to prevent a global food shortage. Here’s an example of how Purdue University is using Hewlett Packard Enterprise technology to develop a data pipeline that will enable new discoveries in agricultural research and food production for a growing, global population. These topics are being piloted through HPE’s strategic partnership at Purdue University, a world-renowned research university, where together we are using and connecting disruptive technologies to create an IoT testbed for the research, development, experimentation and testing of ag-based IoT solutions to drive sustainable ag and food security innovation. It all starts at the edge, and in the case, at the edge of a field in West Lafayette, Indiana. Not just any field, Purdue University’s Agronomy Center for Research and Education, a 1,408-acre research farm. 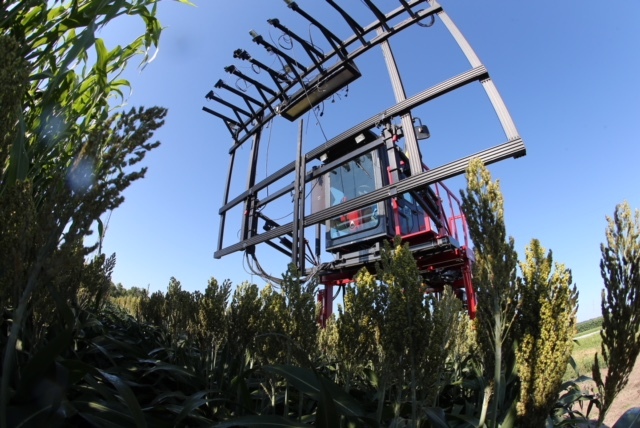 Through the use of digital agriculture, Purdue students and faculty members can gather, transmit, analyze and respond to conditions in the field not previously possible. How does this work? Well through a wireless and IoT architecture that sends sensor data through the Aruba wireless network to HPE’s Edgeline Systems and then to a high-performance computing data center for analysis and AI development. This project has created new innovations including solar-powered mobile Wi-Fi hotspots for recording field data and next-generation adaptive wireless equipment for farm-scale wireless connectivity. These technologies enable Purdue to gather, transmit and analyze field data more effectively and efficiently and play a key role in reducing the time it takes to translate science into discovery that will make a difference.